Common usage conveys the sense of ‘insignificant’ or ‘of little value’’. In economics, however, it is the heart of what is called the ‘Marginalist Revolution’. In essence, mainstream economics holds that all decisions are ‘made at the margin’. Its importance is clearest in profit maximization for the firm which is at the point where marginal revenue (the additional revenue earned from the sale of one more unit output) equals marginal cost (the additional cost of one more unit output). While the concept of national income accounting goes back at least to the 18th century and the work of Francois Quesnay, it was not until 1944 that the concept became a reality. Discussions between the United States of America, the United Kingdom and Canada resulted in adoption of the essential rules and framework for what is now called the System of National Accounts. These discussions emerged partially in response to the theoretical writings on national income by John Maynard Keynes and partially in response to the extensive statistical development conducted in the United States by members of the Institutional School of Economics, particularly the work of the National Bureau of Economic Research established by W.C. Mitchell as well as Schumpeter's extensive statistical work on business cycles. These collections of statistical evidence were used in conjunction with the macroeconomic model of national income and expenditure developed by Keynes. From this marriage of two distinct economic traditions, the System of National Accounts emerged. In 1947, the United Nations introduced international standards for the UN System of National Accounts for all market or ‘Capitalist’ economies. A parallel system of 'material balances' (SMB) was adopted for Second World countries, i.e. the Communist States. It can be argued that the collapse of the Communist economies is directly related to their failure to use the SNA and more importantly to problems inherent in the SMB. Since the collapse of the Soviet Union, the system of national accounts has become the unchallenged international tool for measuring the state of national economies. National accounting is economic and statistical in nature and differs markedly from business accounting. It classifies activities according to economic theory using the concepts and vocabulary of economics. It is one of the most powerful tools of economics and contributes to the development and implementation of macroeconomic policy by governments as well as investment and other decisions of businesses. In effect, it presents an over-all picture of a country’s economy in quantitative terms. It is based on a rigorous accounting framework using all statistical data related to the economic activity of the country. It describes consumption, distribution, and production as well as the division and accumulation of wealth. It records the transactions among the major sectors of a nation’s economy. It facilitates comparisons between countries and study of national economies. It is important to understand that the SNA consists not only of a final ‘top level’ reporting of national economic activity. It also includes a set of integrated components including the Standard Industrial Classification (SIC), the Standard Occupational Classification (SOC) and the Standard Commodity Classification (SCC), among others. But while the United Nations has established standards, each nation uses slightly different SNAs and related classification systems. To overcome comparative problems that such differences create, particularly in an era of increasing ‘free trade’, various ‘concordances’ have been signed between nations to overcome such differences, e.g. the concordance between Canada and the United States and between the United States and the European Union concerning the SIC. Gross domestic product (GDP) is the sum of all currently produced final goods and services sold at market prices. “At market prices” is the way GDP can measure, in a single number, the production of apples plus oranges plus railroad cars plus all of the millions of other goods and services produced in a major economy. Theoretically, however, goods not sold in markets should be also be included in GDP, e.g., services of homemakers or output of home gardens, as well as illegal activities such as the sale of narcotics, gambling, and prostitution. Also, because it is a measure of the value of output in terms of market prices, GDP, is sensitive to changes in the average price level. The same physical output will correspond to a different GDP level as the average level of market prices varies. To correct for this, the concept of nominal GDP is used to calculate real GDP, which is the value of domestic product measured in constant prices from a base year. In effect, this is an attempt to measure actual or real output, e.g. the number of cars, computers and meals served. 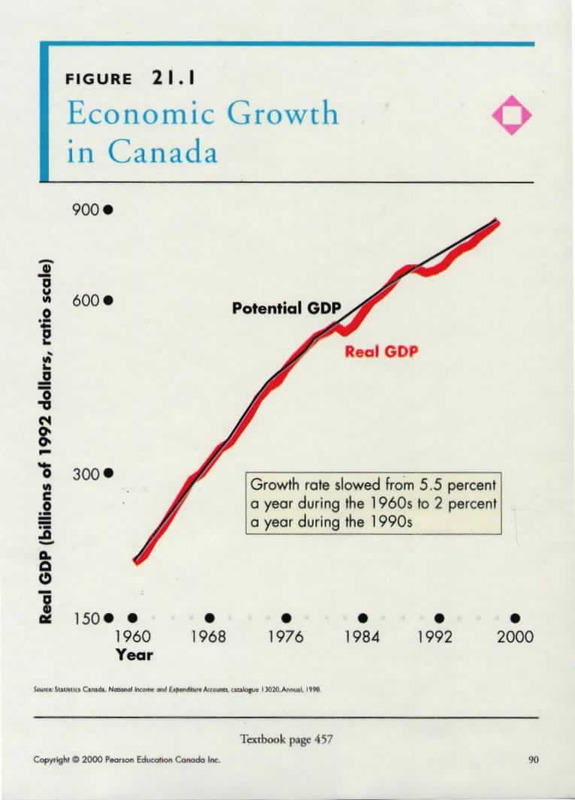 GDP is the unduplicated value of production that originates within the boundaries of Canada regardless of the ownership of the factors of production. The sum of GDP across all industries provides an estimate of the total value of production in the economy. GDP can be valued either at factor cost or at market prices. Valuation at factor cost represents factors of production. GDP is often referred to as a 'value added' measure of production since it represents the value added to the purchased units by the factors of production, labour and capital, that are owned by the establishments in the industry. The valuation is expressed in terms of the expense of the producer, rather than the cost to the purchaser. It excludes all indirect taxes such as sales and excise taxes, customs duties and property taxes; but it includes subsidies paid to the producer by the various levels of government. To derive a measure of unduplicated production for each industry and intermediate commodity inputs that are consumed by that industry must be deducted from its gross output. For this reason, GDP or value added, may also be referred to as the 'net output' of an industry. It is important to note that GDP excludes the sale of imported goods and services, among other things, that when included generate what is called “Gross National Product’ or GNP. GNP in effect measures the total value of all sales of final goods and services in the current time period, not just those produced domestically. ‘Current’ refers to a specific time period, e.g., a quarter (3 months) or year, and to goods and services actually produced in that timeframe. This means that the sale of ‘second-hand’ goods and services are not counted. For example, sales of second-hand cars or houses are not included. Further, sales of financial as opposed to ‘real’ assets are not included in GDP, e.g., stocks and bonds vs. cars or meals served. This raises another definitional question: what is the difference between ‘nominal’ and ‘real’? Nominal refers to the dollar or money value of a good or service while ‘real’ refers to the actual number of goods and services. Thus the monetary value of production may rise while the actual or ‘real’ number of goods or services may not, i.e. price inflation. In essence, “final’ refers to goods and services sold for consumption rather than production purposes. Goods sold for production purposes are called ‘intermediary’ or ‘producer’ goods. Such goods are not included in GDP because they contribute to the value of final goods in whose production they are used. Counting them separately results in double counting, e.g. counting the flour used in making bread and then again when the bread is sold. There are, however, two types of producer goods that are included in GDP: capital goods and inventories. Capital goods are ultimately used up in the production process, but within the current period only a portion of their value of the capital good is used up. This portion is called ‘depreciation’ and is included in the value of final goods sold. If capital goods were not included, we would be assuming that they depreciated fully in the current time period. However, the whole value of the capital good is included as a separate item in GDP. In a sense this is double counting because the value of depreciation is embodied in the value of final goods. This double counting requires a netting out of depreciation that generates a net output measure of GDP (NDP). Increases in the inventory of final goods held by producers is also included in GDP (even though they remain unsold) because they are currently produced output. Inventory investment in materials (and other producer goods) similarly are included in GDP because it represents currently produced output whose value is not embodied in current sales of final output. Inventory investment can be negative or positive. If final sales exceed production, for example, inventories are run down to meet demand (negative inventory investment), GDP will then be less than final sales. National income is the sum of all factor earnings from production of current goods and services. Factor earnings are incomes of factors of production: land (rent), labor (salaries & wages), and capital (interest and investment income). Each dollar of Gross National Product (GNP) is one dollar of final sales (including the sale of imported goods and services, i.e. goods and services not produced in the domestic economy), and if there were no charges against GNP other than factor incomes, GNP and national income would be equal. There are, however, some other charges against GNP that cause national income and GNP to diverge. The first is depreciation. The portion of the capital stock used up must be subtracted from final sales before national income can be computed; depreciation represents a cost of production, not factor income. Making this subtraction generates net national product (NNP). From NNP, both indirect taxes, e.g., sales and excise taxes, and the net amount of some additional but minor items labeled “Other”. An indirect tax such as a sales tax represents a discrepancy between the market price (what something is sold for) and the actual revenue received by producers. National income refers to income earned by all factors in the current production of goods and services. Income earned by different factors of production has significance with respect to subsequent spending, e.g. profits (or more properly ‘retained earnings’ not distributed to shareholders) earned by firms are a primary source of investment in new plant and equipment. Similarly, income earned by persons, regardless of source, is important because it fuels consumption. Personal income is the national income accounts measure of income received by persons from all sources. However, all that is earned is not in fact available for consumption (or savings). Personal income is subject to taxation, e.g. income tax and payroll taxes including unemployment insurance premiums. When personal tax payments are subtracted from personal income (and transfer payments by the government to individuals or households are added), the result is disposable or after-tax personal income. It should be noted that Canada Pension Plan (or Quebec Pension Plan) premiums are not considered taxes but rather a form of ‘forced savings’. a) The foreign sector is omitted. This means net exports term and net foreign transfers are excluded. In effect this means that GDP will equal GNP and in the models these terms can be used interchangeably. b) Indirect taxes (such as sales taxes) and the other discrepancies between GNP and national income will be ignored. It will be assumed that national income and national product or output are the same. The terms national income and output or expenditure will be used interchangeably. or GDP equals consumption (C) plus realized investment (Ir) plus government purchases of goods and services (G). The subscript (r) on investment is used to distinguish between actual or realized investment from the planned or desired level of investment. So far the device used to measure GDP and other components of the System of National Accounts has been ‘market prices’ which can be defined as the ‘current’ ruling price in the market. Since GDP is the value of currently produced goods and services measured in market prices, it changes when the price level changes as well as when the actual volume of production changes. For many purposes a measure of output is required that varies only with the quantity of goods produced. Such a measure would, for example, be more closely related to the level of employment; more workers are not needed to produce a given volume of output simply because it is sold at a higher price. 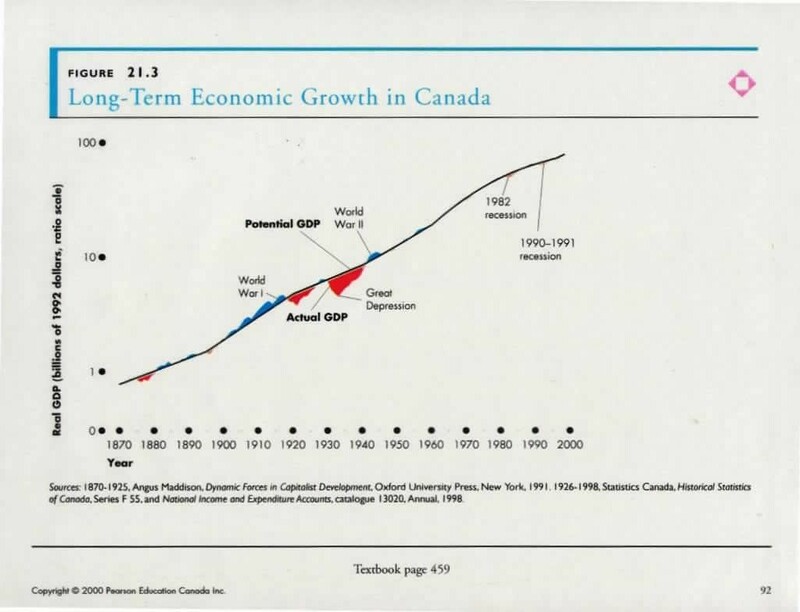 To distinguish between changes in GDP that are ‘nominal’, i.e. reflect changes in price levels from ‘real’ that reflect changes in the actual volume of output various price indices are used. Such price indices generate measures of output in what are called ‘constant’ as opposed to current dollars. A good mathematical summary of the process of creating price indices is available on the Web provided by the Australian Bureau of Statistics produced for a 1993 regional workshop on the SNA. Another site with a good web page of the math is provided by the University of Chicago which highlights the ‘chain equation’ approach. 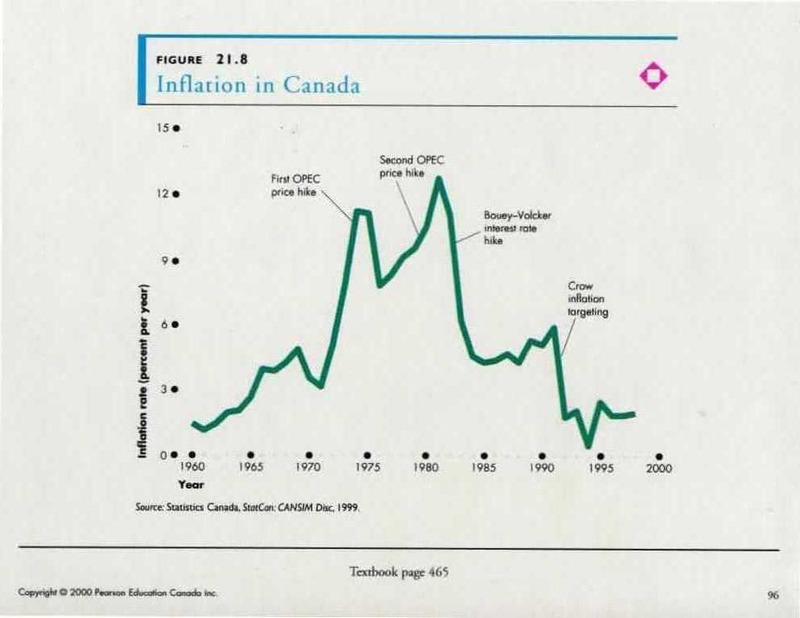 In Canada there are three principle price indices: the consumer price index (CPI), the implicit GDP deflator (IGDPD) and Industrial Products Price Index (IPPI). The Consumer Price Index (CPI) is a general indicator of the rate of price change for goods and services bought by Canadian consumers. It is obtained by comparing, through time, the cost of a fixed basket of commodities purchased by Canadian consumers in a particular year. Since the basket contains commodities of unchanging or equivalent quantity and quality, the index reflects only pure price movements. The IGDPD is a broad measure of prices derived from separate estimates of real and nominal expenditures for GDP (or a subcategory of GDP). It is thus an index of prices for everything that a country produces, unlike the CPI, which is restricted to consumption and includes prices of imports. The Industrial Product Price Index (IPI) measures price change for domestically produced products whether sold in Canada or abroad. It represents selling prices at the boundary of the establishment, wherein the cost of taxes collected at that point and transportation provided by public carriers beyond that point are excluded. Prices are reported for finely specified transactions wherein both the good and terms of sale are identified. In summary, price indexes are used to distinguish between ‘nominal’, i.e. money terms, from ‘real’, i.e. actual, GDP. A basket of goods (e.g. 6 oranges, 2 apples and a partridge in a pear tree) is chosen in a given year – T1 - (based upon the current buying habits of consumers or producers) and then priced in current dollars. In some subsequent year – T2 , the same basket of goods and services is valued using what are then ‘current’ prices. The cost of the basket in T2 is divided by that in T1 then multiplied by 100 to indicate how much prices have increased with no increase in the size or composition of the basket. The resulting ‘price index’ provides a way to estimate how much output actually increased as distinct from the nominal value of output in a subsequent timeframe. Employment refers to the use of a factor of production whether it be capital, labour, natural resources, entrepreneurship or technology in the production of goods and services. Full employment, in principle, refers to use of all the available supply of a factor. Unemployment therefore refers to that quantity of a factor that is available in an economy but which is not employed at a given point in time. If all available factors of production are fully employed one says the economy is producing output at its ‘potential’. In practice employment/unemployment is usually used in reference to labour. Furthermore, full employment does not, in practice, mean that all the available supply of a factor is in fact employed. In the case of labour there are at least four factors that limit the definition of full employment – structural, seasonal and frictional unemployment and the participation rate. First, at any given point in time new technologies of production are in the process of displacing older technologies. Labour employed using the old technology may not be trained or educated in the use of the new technology which as it is introduced, in effect, throws such workers out of their jobs. Until they can be retrained and/or re-educated the total of such workers constitutes the level of ‘structural unemployment’ in an economy. 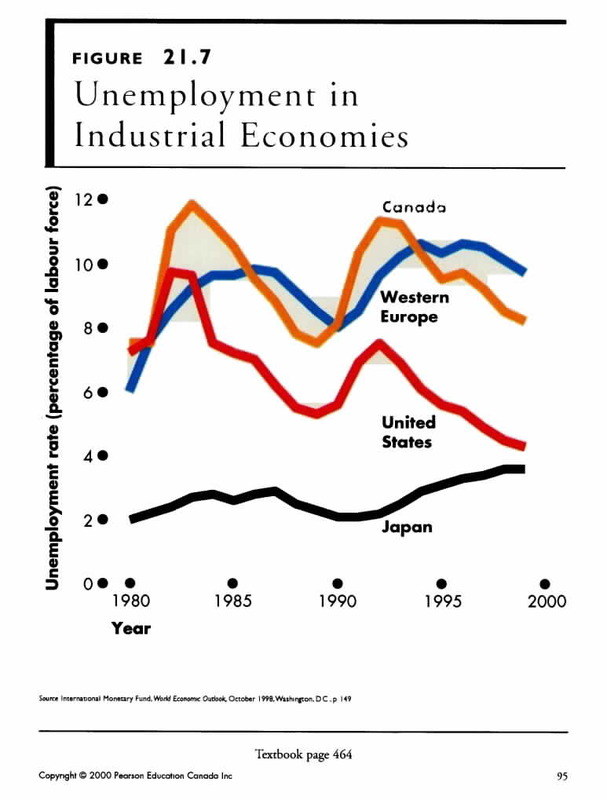 In addition, geography often plays a role in structural unemployment. Workers in a region that is dependent on a technology that is being or has been displaced may have difficulty in finding new jobs either in the emerging new technology industries or other sectors of the regional economy. For social reasons (and sometimes due to government policies) such workers may not want or be able to move to other regions to find new jobs. Second, some industries are seasonal in nature, e.g. farming, fishing and forestry. During part of the year there simply is no work available and workers in such industries constitute ‘seasonal unemployment’. Estimates of the unemployment rate are therefore usually ‘seasonally adjusted’ in recognition of this reality. Third, at any given point in time there are some workers who are ‘between jobs’. The total of such workers constitute what is called ‘transitional’ or 'frictional' unemployment. The economy may indeed have available jobs but it takes time to find them. Taken together structural, seasonal and frictional unemployment, in effect, reduce the demand for labour and hence the definition of what constitutes ‘full employment’ and therefore the potential output of an economy. Difference between countries caused by these three factors mean that what ‘full employment’ means varies between countries, e.g. Canada and the United States. 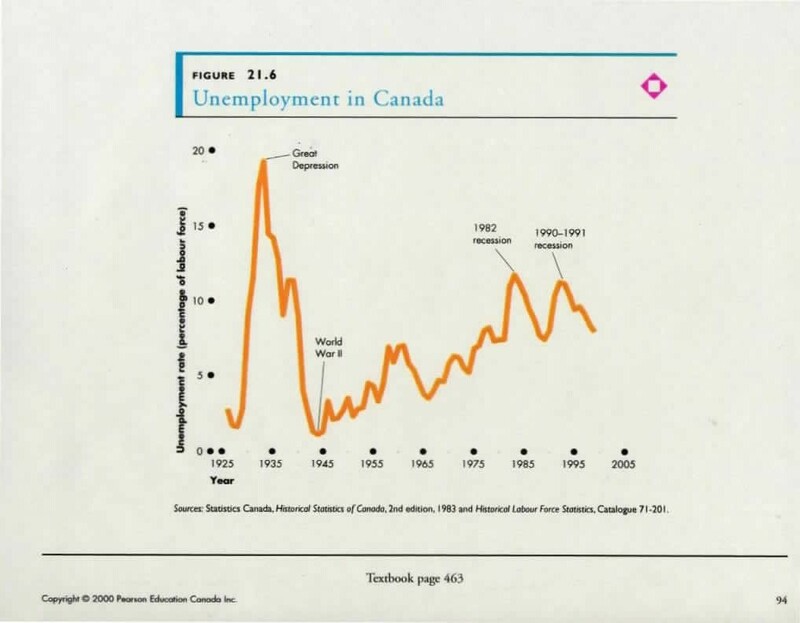 Finally, the participation rate affects the supply of labour and hence the unemployment rate. To be unemployed means that one does not have a ‘paying’ job but is actively seeking one. The percentage of the working age population that is employed and/or is actively seeking work is called the ‘participation rate’. If one does not have a job and is not seeking one (for whatever reason), one is not technically unemployed. The participation rate, however, tends to vary depending on the state of the economy. If the economy is in recession (or depression) many unemployed workers eventually give up seeking work. Such workers are called ‘discouraged’ workers. When the economy turns around or is booming many formerly ‘discouraged’ workers (and others, e.g. students) realizing that jobs are available return to the labour force and the participation rate rises. One economic paradox is that following a recession while more people have jobs the unemployment rate may actually increase because the participation rate increases faster that the number of new jobs. For purposes of our analysis of the various macroeconomic engines it will be assumed that there is no structural, seasonal or transitional unemployment and no ‘voluntary’ unemployment, i.e. no discouraged workers. Money matters. But how much? Believe it or not this will be a principle question in our construction and operation of the alternative economic engines to be used in this course. To the Classicists it matters not at all; to the Keynesians it matters but not significantly; and, of course, to the Monetarists it is the question. So what is money? And why do people need money? There are three reasons: transactional, precautionary and speculative demand. The fact is that money is an abstract good whose definition has and continues to change through time. There is great controversy in economics about what is money. One thing is clear, the cost of money – the interest rate. And different forms of money have different costs. For example – APR financing refers to the interest rate cost above the ‘prime rate’ vs. credit card money charges. For purposes of this course, money is whatever is commonly accepted as payment in exchange for goods and services (and payment of debts and taxes). And until late in this course it means what is called M1 & M2 - currency and ‘chequable deposits”. By the way, some theorists push the envelop up to M12. If there is a primary objective to the macroeconomic policy of governments around the world it is: economic growth. On the one hand it is the increase in GDP (real vs. nominal). 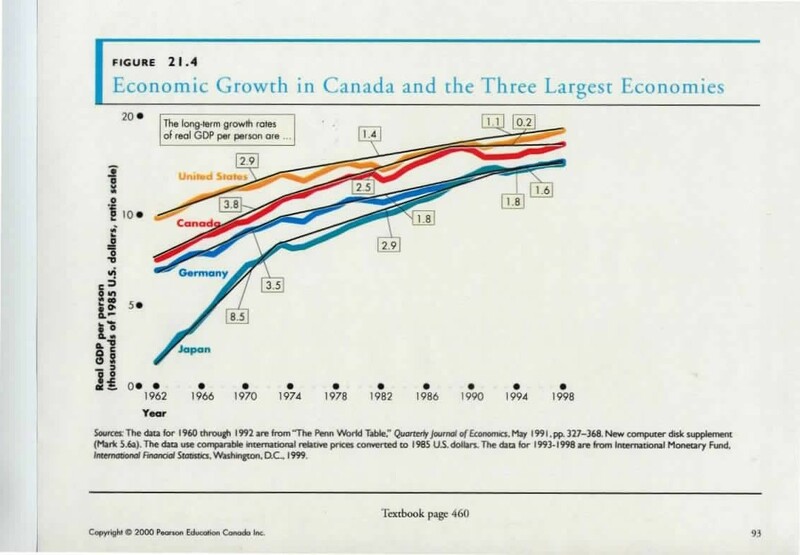 On the other hand it is growth in GDP per capita, i.e. per person. Growth occurs over time and hence we have a ‘growth rate’, i.e. the percentage change for T1 to T2. One can have both positive and negative growth, i.e., decline over time. A distinction must also be drawn between the growth in terms of actual and growth of potential economic output. 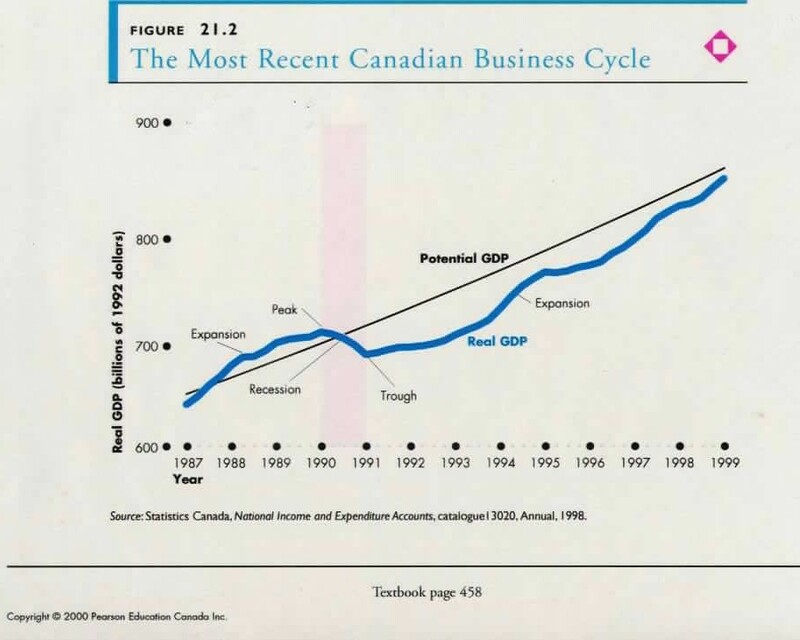 Thus coming out of a recession (a period of negative growth), one can measure the actual increase in GDP, e.g., per capita or the increase in the potential of the economy for output. For example, the discovery of new natural resource deposits increases the potential of the economy while the actual exploitation of such resources provides a measure actual growth as opposed to potential. Economic growth and its measurement are critical questions. The relationship between measured growth and the ‘welfare’ of a society and its members is, however, a question that returns us to the distinction between ‘market’ growth and non-market changes, e.g. 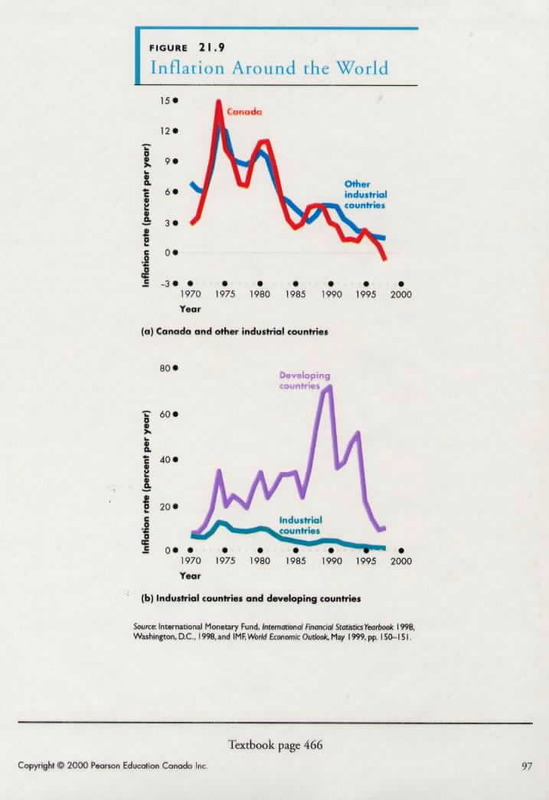 increases in pollution resulting from measured increases in GDP.